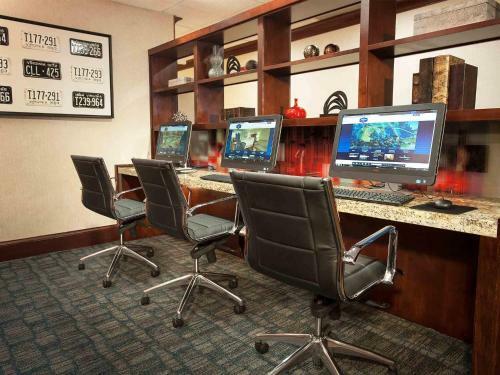 Minutes from Washington Dulles International Airport and offering free airport transfers, this hotel features many modern conveniences, and is situated close to a variety of points of interest. The Hampton Inn Dulles/Cascades provides in-room microwaves and refrigerators as well as a free continental breakfast. Guests at the hotel can also take advantage of high-speed internet access and an indoor swimming pool. Only a short distance from the Dulles/Cascades Hampton Inn is the Cascades Marketplace and Dulles town centre, filled with shops, restaurants and entertainment options. The historic city of Leesburg is also within driving distance and features Civil War battlefields and historical sites. the hotel Hampton Inn Dulles/Cascades so we can give you detailed rates for the rooms in the desired period.